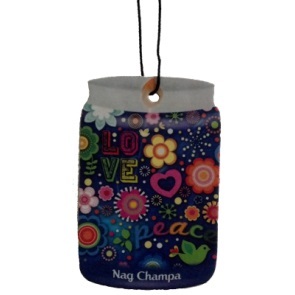 This Nag Champa Smoke Odor Air Freshener has that fresh classic hippie Nag Champa scent. Smoke Odor Exterminator Nag Champa Air Fresheners are great for cigars, cigarettes, and pipes. This air freshener attacks and removes smoke odors. These fragrant air fresheners make wonderful gifts even for non-smokers! Smoke Odor Air Fresheners are made in the USA! I absolutely love this item the scent last a long time. Wish it was more available in my area. Perfect it brings me back to a time I almost forgot . I have to order more !!!!! !